Each system in a network provides various applications and services or accesses them. If there are many applications, services and systems in an environment, there is no chance of evaluating relations and dependencies without software support. For Windows systems, Docusnap captures the open TCP/UDP ports and existing connections to or from other systems during the inventory process. 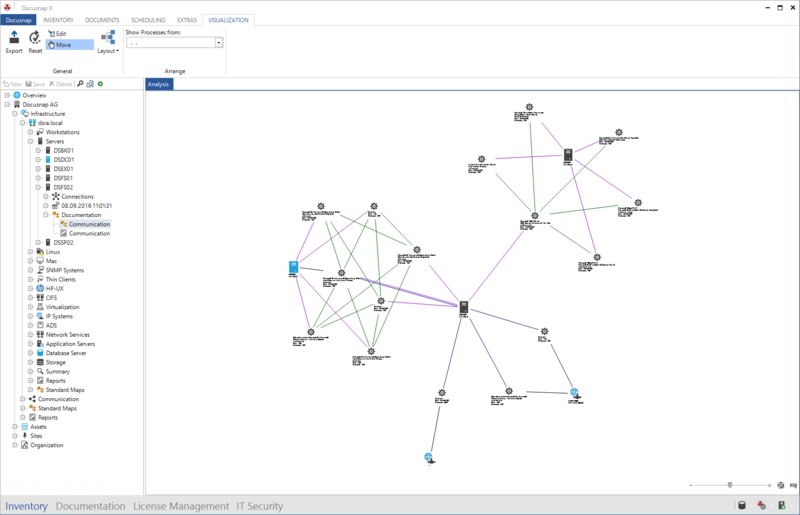 With each inventory scan, Docusnap expands and adds to this information, building an extensive connection diagram for the network over time. There is the option of evaluating these connections based on a system (i.e. ‘show all connections related to this system’) or based on an application/service (i.e. ‘show all systems which use a specific service such as SMTP’). Evaluations can be carried out in the form of diagrams or via reports and Excel exports. Thanks to the communication path functionality, important connections can be detected and considered in the planning even in unknown systems.